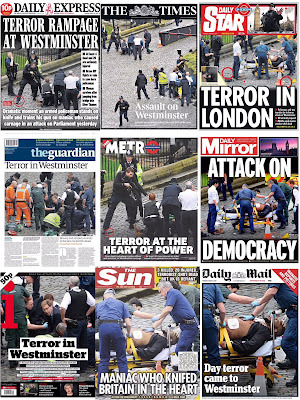 Last week's newsquiz was clearly a challenging one. The top individual submitted score was a modest 14.5 by Gavin Devine, narrowly ahead of Liz Gerard on 14 and Simon O'Neill on 13. The lowest submitted (I won't name names) was 5.5. The highest team score was by the Penman Partnership with 15, narrowly beating their rivals the Batstone Collective on 14. This week has been a grim one with the news dominated by terrorism striking close to home. How closely have you been following these and other events? Here's the quiz ... as usual 25 questions about the week. Test your knowledge and let me know how you get on. 1. Who told a vigil in Trafalgar Square, paying tribute to the victims of the Westminster terror attack, that: 'Evil and twisted individuals who tried to destroy our shared way of life will never succeed’? 2. What is the parliamentary constituency of junior foreign minister Tobias Ellwood who gave to CPR to police officer Keith Palmer at Westminster? 3. Police searched a hotel in which city where they believed Khalid Masood had stayed hours before carrying out the attack on Westminster Bridge? 4. Which football club left a scarf on the seat of PC Keith Palmer and will hold a tribute to him at its next home game? 5. Tony Davis, who jumped over a fence to help PC Keith Palmer, is a Team GB coach in which sport? 6. A man armed with a rifle and knives was arrested after driving a car at high-speed at crowds in which other European city? 7. In his last public appearance before his death, former deputy first minister of Northern Ireland Martin McGuinness said: 'My heart lies in the _____ and with the people of _____.’ What are the two missing locations? Half a point for each. 8. Who said of Martin McGuinness: 'I’m just pleased that the world is a sweeter and cleaner place now. He was not only a multi-murderer, he was a coward’? 9. On being told that Britain would trigger article 50 on March 29, European Commission President Jean-Claude Juncker said: 'Half memberships and _________ aren't possible. In Europe you eat what's on the table or you don't sit at the table.’ What is the missing (hyphenated) word? 10. Whose decision to stand as a candidate in the Manchester Gorton by-election was described by Labour as 'entirely self-serving and offers nothing to the local community'? 11. Theresa May posed for a fashion shoot with photographer Annie Leibovitz for which magazine? 12. Rock ’n’ roller Chuck Berry, who died at 90, had only one No 1 hit in the UK. What was it called? 13. A wing of the National Gallery was evacuated after a man with a screwdriver attacked a painting by which artist? 14. Where was a 350ft image of Dame Vera Lynn projected to celebrate her 100th birthday? 15. He was born in Stamford, was the son of a taxi driver, studied classics at Cambridge, was awarded the OBE and, despite gaining fame in another field, claimed that he was a born teacher. Who is he? 16. The cost of NHS prescriptions in England is going up by 2.4 per cent from next month – pushing a single prescription up to what price? 17. Grand Tour presenter Richard Hammond was knocked out after falling from his bike and hitting his head in an accident in which country? 18. Which company promised an overhaul of its advertising policies in response to a boycott from leading brands including Marks & Spencer and McDonald’s? 19. What, according to Lord Sugar on Twitter, was 'the best birthday present I could have asked for on my 70th'? 20. Who said goodbye to international football after 130 appearances by scoring his 49th goal for his country? 21. Britain announced that it is to ban laptops in cabins of flights arriving in the UK from six countries. Name four of them. Half a point for three, a full point for four. 22. According to a United Nations Agency report which country is the happiest in the world? 23. Research by the Consensus Action on Salt and Health found that what drink was as salty as sea water and contained more salt than a packet of ready-salted crisps? 24. Matt Tebbutt was named as the new permanent host of which TV programme? 25. For the first time in a decade, Sesame Street is to introduce a new puppet. Her name is Julia and she has which disability?